Why does the croaker croak? The tip of my rod tickled the air. I only looked up from book four of the Game of Thrones series. Whatever was on the other end of the line either wasn’t big enough or wasn’t on the hook yet. I shifted my feet in the hot sand until I found the coolness of the thermocline’s underbelly. The rodtip danced and the rod shifted. I picked up the rod and waited until I felt a good hard tug and jerked back. It wasn’t a big fight, but it was good to feel my line taut. Silver and pinkish scales shimmered as I landed the fish. As soon as I pulled it from the water it croaked at me furiously, like a politician frog giving a heated stump speech. Croakers and the drums are not the only fish to croak. I remember catching catfish in the ponds of Arkansas when I was a kid and listening to their Gwork, Gwork of their croaks. As I pulled the hook from his mouth, he croaked feverishly – his own piscine version of cussing. I would too if you jammed a meathook through my cheek just as I took a bite of steak and then drug me outside by my cheek. 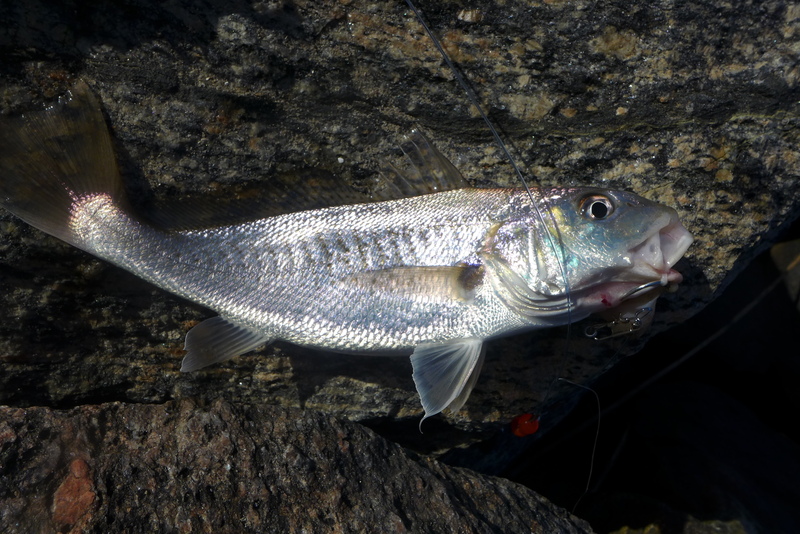 I let him go back into the murky water so he could go tell his croaker buddies about what had just happened. But apparently some didn’t listen as I caught 7 more.